3.10.2008. Today I took my last dose of Phenobarbital, thus ending an 11 year battle with tranquillizers (Benzodiazepines and Phenobarbital), 9 of which have been spent tapering. It is hard to put how I feel into words. There is a huge measure of relief that this part of my journey is finally over. No more making up ‘drug water’ everyday so that I can make tiny cuts, no more medicine syringes and cylinders lying around the kitchen, no more charts on the fridge door recording the doses taken. I have a sense of excitement about what is to come about getting well again and doing many of the things I haven’t been able to do over the last 11 years. I also feel sad at what I have lost over the last 11 years, grateful for what I have learned and a bit worried that the future won’t be a bright as I hope it is going to be. 4.10.2008. I want to write a little about today because it has been a full one as it has coincided with the celebration of my Dad’s 80th birthday. I had a really easy time this morning and then I took my Dad and Mum to see the musical the Sound of Music – matinee performance as I am not up to an evening one yet, afterwards we went for an early supper. Bought a bottle of champagne, I didn’t drink of course, but it gave me a great deal of pleasure to buy the champagne and share it with the three people who have provided me strong, steady and on the ground support through out this journey. They have all been here day in and day out, just doing the things I couldn’t manage, talking if I needed to talk and providing me with company as I struggled through. I couldn’t have done it without you guys! A little more about what I did today – I couldn’t have done it a year ago. I only ventured back to going to the theatre 3 months ago and this time last year I had just started to go out to dinner again after a 7 year gap. I didn’t find the musical easy – took a while to settle in, all the exciting sights and sounds made me a bit over anxious but I just sat there and enjoyed what I could and got settled into it after a while. The dinner afterwards was easy. One of the main problems I have encountered is having a delayed reaction to doing things so it will be interesting to see how I am tomorrow. 5.10.2008 Well as predicted, I am a little under the weather today with increased symptoms, head symptoms in particular. I woke up with a dizzy spell and a headache – a bit like a hangover. I had a series of sharp pains in my head and ears throughout the day and the feeling of head pressure. It was generally a quiet day, I didn’t want to go out but I did manage some household chores, including putting the vacuum cleaner around. The vacuuming is one of those jobs that I have found too difficult to do for many years and it is only in recent months that I have been doing it again. It seemed that every time I tried to vacuum would start getting electric shocks through my head – so very off putting. When I started doing it again I did it slowly – a room at a time with a rest in between but now I can do the upstairs in one go but am still having a rest before I lug it downstairs. 7.10.2008 I want to set myself some goals for this year of recovery. I would like to be well enough to fly to Sydney for a holiday, or if I can’t do that just to have a holiday anywhere because it has been 11 years since we left Wellington. I would like to be well enough by the end of this year to be able to do my own grocery shopping every week. At the moment I am able to go into a supermarket for a few things without feeling too bad but I haven’t tried to do the whole family shop yet. I will probably start doing that after Christmas. I would like to be well enough to be able to walk up to my local shops when I want to. It is a trip of about 2km mostly up hill getting there. There is a nice little coffee shop at the top and it would be cool to go up have a coffee and then walk home. Just recently when I had a really good day, I did manage to get up to the shops but it wasn’t easy and I got a lift home – so I am looking for that walk to be fairly easy by the end of the year. So those are the aims, achieving them is mostly something that I have little control over because it will depend on how quickly my body and brain decided to heal but some of it will be down to me as I will need to work on my physical fitness and there will be some anxiety to overcome given it has been a while since I did any of those things. 11/10/2008 One week off today. It has been an Ok week. I didn’t turn to custard as a result of being off so that is a good start. Not sure that anything miraculously got better but I wasn’t expecting it to. My sleep has been quite good this week but I think it is too early to judge whether that is a permanent thing or I just happened to have a good week. I didn’t have many nights lying awake for ages waiting to get to sleep or many nights waking in the middle of the night and not dropping back off again. My sleep seemed a bit disturbed because I was conscious of waking up but I went back to sleep again quickly. I have been fairly careful not to over do things and set myself back. I almost did yesterday. I started the day with quite a bit of housework, then went out and did a few chores and ate lunch out and had a walk on the beach and then did a wee bit in the garden in the afternoon – and I didn’t feel so good last night but I have been Ok today but not game to do too much. I guess a typical day for me at the moment goes something like this. - Get up at 8am. - Do an hour of something else. - Have a nap for an hour or an hour and a half. - Sit down in front of TV about 6.30. There are still quite a few things that I don’t like about my day. It would be nice to get up a bit earlier, and to get rid of the daytime nap. I would like to do more physical activity and less time on the computer but no doubt that will come. In addition to the run of the mill this week, I have had two outings to lunch and had one visit to the doctors so all in all a fairly full week. 12/10/2008 Last night was a bit different and an achievement. Brett and I when out to eat at a place that had a blues band in for the evening. We took the earliest booking which was 6.30pm but still late for me to be out and to be eating. We needed the later booking because the band wasn’t due to start playing until then. They didn’t start until later of course but it was nice to have a three course meal and listen to live music. The music was very lively and the place was full – so lots of atmosphere with people dancing and clapping but I coped pretty well. The restaurant is down by the harbour and the sun setting over the water was nice. We stayed until the band was half way through its routine and then left and had a walk on the beach. There was a full moon and the night was still and warm – so all in all a very nice evening. I didn’t think I was reved up or anything but I didn’t sleep so well last night and I am tired today – but worth it. 19.10.2008 Two weeks off. Last week wasn’t as good as the first week off. I had three OK days and 3 not so good days and one really not good at all days. The bad day followed a really busy good day so it is still very easy for me to over do things. My busy day saw me doing some housework and gardening. I went out to lunch, had a walk on the beach and had my daughter to tea, all of which may have been OK but then a friend dropped by in the evening for 2 hours and that was definitely too much. The next day was back to headaches and dizziness and the rest of the week recovering. 26.10.2008 Three weeks off. I guess I will give the week a 5/10. I don't feel as well as I have at times but then again I have felt so much worse so, no complaining. From an activity point of view the week has been full. We had a family gathering, just seven of us. A couple of years ago I either wouldn't have gone or it would have been very difficult to endure but it was fun. I was even able to help with some of the cooking, whipping up one of my famous lemon meringue pies and a potato salad and I enjoyed doing that. Last weekend my husband had tickets to a jazz/blues concert that he wanted to attend. It was a 8.00pm concert and I can't remember the last time I went out for fun on a Saturday night, it was certainly pre-drug so we are looking at 9 years and if the truth be told it was probably pre- children, so maybe 25 years. I was worried that I wouldn't cope very well. I took the precaution of spending a lot of the afternoon in bed and I was fine. I actually enjoyed it and didn't feel nervous. The interesting things was that I actually felt quite relaxed when I got home and slept really well. This has led me to question what I do at home in the evenings and I think I need to make sure I have more relaxation time before bed - anyway will see if that makes a difference to my sleep. 3.11.2008 Four weeks off. I will give this last week a 6/10. I haven't done anything major but the week has been fairly busy with routine things like housework and gardening. Have had lunch out a couple of times. Have started some Christmas shopping. When to see a friends daughter dance at a end of year concert and have mostly felt ok. I have been lucky enough over the last few months to get some paid work to do at home and this week saw another 16 hours come in. This is both a challenge, something different to do and rewarding and having some pocket money is also wonderful. 17.11.2008 We are at the six weeks off mark today an it has been two weeks since I last wrote anything. The majority of the last two weeks have been pretty good and I think I could even give them a 7/10. I felt well enough to invite my niece around for a meal and to do some cooking for a neighbour and her family. Generally I have been busy with some computer work and with work around the house and garden. I have been trying to work on my physical fitness again. I increased the distance and difficulty of my walk (easy to do when you live on a hill) and tried to add in a tiny bit of work with weights and flexibility. I can certainly do this but after a few days I have had a considerable increase in the muscle tension and pain around my head and face. The pain has been quite severe and has affected my jaw, teeth, eyes, throat and especially my ears which feel like I have an infection in them - so I need to drop the exercise down again. Needless to say that is very frustrating. I am thinking about having a weekend away shortly. I haven't done that in 10 years. Trying to work out when and if I will feel Ok seems like an issue but I suspect I should just do it and not think so much about it - so watch this space. 24.11.2008 Just over seven weeks off. One of the things that I have really missed over the last 10 years is the ability to go away for a holiday and travel around a bit. Holiday's have always been something that Hubby and I enjoyed doing together, we tried to have at least one break away a year and often went overseas. In the last 10 years we haven't been away at all. While I would very much like to be well enough to jump on a plane and head to Europe for 6 weeks, I don't think that is going to happen anytime soon, but decided that I might manage to go away for the weekend, if I attempted to take it easy. We planned a couple of nights away in a area not too far away from Wellington, in the Wairapara. This involved a trip of an hour and a half over the ranges, staying in Masterton and then seeing some of the local sights from there. We set off on Friday morning and had a lovely trip over, the weather was fine and sunny and the country side was just beautiful. We arrived in Masterton fairly early and then traveled on to Mt. Bruce to see the bird sanctuary and to walk in the native bush. There were lots of benches to sit on so I was able to wonder around and enjoy watching for the birds to appear. After lunch we headed for the hotel so that I could have my nap. In the afternoon, I went to the pool and my first swim in 10 years that was pretty cool. In the evening we treated ourselves to a a meal at the hotel restaurant, expensive but very nice. Day two we drove to Castlepoint, a beach and fishing village about an hours drive out of Masterton. The drive is through some lovely countryside. Castlepoint has a light house and a wild beach and is a good place for gentle walking and sitting. We returned to the hotel early afternoon again this time opting for fish and chips sitting in the local park after our swim. The third day we drove home via a WWI air craft museum and some nice shops. I managed the whole experience pretty well. I am pretty tired today and I still have the ever present pain in my head and ear but I did enjoy getting away. I am not ready for London yet but small steps! 4.12.2008 the pain in my ear has been getting worse and I have been concerned that it might be either an ear infection or something to do with the fact that I am getting increasingly deaf in that ear so I took myself off to the doctor today. I explained the situation to him and told him I just wanted him to check that I didn't have anything acute going on as I was 90% sure it was withdrawal. He assured me that at 2 months off it couldn't possibly be withdrawal. We discussed that issue and I told him he was incorrect, which he took in his stride. After a good check up, we eliminated the possibility of an ear infection and the deafness causing the problem and he concluded that is was mostly the tightness in my face and jaw caused by the withdrawal that was giving me the pain in my ear! 22.12.2008 this has been a very significant day for me on two accounts. Firstly I packed up all the left over pills that I had around the house and delivered them back to my pharmacist for safe disposal. This definitely makes it feel like these pills are out of my life. It was also my last appointment with my physiatrist/addiction doctor - that feels so good after seeing him at least once every 3 months for the last 10 years - guess I must be clean and sober and sane now. I always was but at least it is official now! 25.12.2008 Happy Christmas. I have done such a lot for Christmas this year compare with the last 9 years. I managed to shop for everyone, I did all the cooking and had 8 people here for a Christmas dinner. I managed to see all my friends for Christmas get togethers prior to that day without feeling that it was a huge commitment on my part. And most of all I was able to enjoy the day, previous all I hoped for was to get through the day without a melt down. Am I tired now? - oh yes I am really tired, but in a good way. 3.1.2009 Three months off today - that must be a milestone. The pains in my head and ear have finally gone away and I am feeling much better as long as I don't over do things. However it is still really easy to over do things. I get tired very easily with too much physical exertion and if I am put under stress by even small things then I get the shaking and heart palpitations but I can take more stress than I used to be able too so it is all good. The worst symptoms is still the dizziness feeling I get, I hope it is withdrawal and will eventually fade but like everyone I worry that it has something to do with my epilepsy or whatever was originally wrong with my brain that made people think I had epilepsy. No doubt time will tell. 23.1.2009 I have just returned from 3 days away with my Mum and Dad. We journeyed up the coast from Wellington to Waikanae and had a very relaxing time. 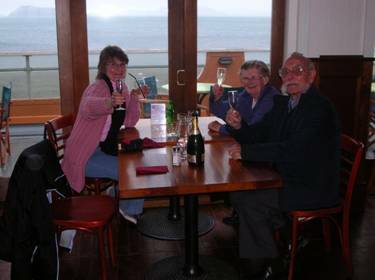 We ate in a beautiful restaurant with magnificent views of the beach and Kapiti Island. Two evenings found us eating takeaways on the beach in the sunshine. We visited three places that look after animals, did a bit of shopping and even had a swim. I think I have improved since my trip away in November. I was able to cope with an hour on my feet but after that dizziness started to become a problem. A couple of times I started to get the sensation that the ground had gone soft under my feet when I stepped - definitely time to sit down at that point. Still need a lie down in the middle of the day in order to get through the day in one piece. Things are moving in the right direction but not where I want them to be yet. Tinnitus 24/7 but worse when stressed. Mainly in right ear. It is pre-existing due to an old injury. It has got worse during withdrawal but I don’t know if that is withdrawal or just a natural progression as a result of the injury. I also notice that I am just about completely deaf in my right ear and assume that is the result of the injury and not the withdrawal. Dizzy spells. These are still there. They can happen many times a day. They are worse in I am tired, stressed or too physically active. They range from momentary dizziness to a feeling of impending dizziness where I just feel like I don’t want to stand up straight – that happens when physically active. It can be worse in the morning when turning over in bed and when getting out of bed in the middle of the night. Insomnia – this is still a bit of a nuisance although it could be worse. It takes a long time to get to sleep, often wake in the night, often sleep well in the few hours before morning, probably average 5 - 6 hours a night. Sometimes am half awake in the night, am aware of being awake but brain is half asleep and it is very hard to get back to proper sleep from there – I need to get up wake up properly and then I can go back to sleep. Sometimes I sleep 8 hours and that is good. I have been trying to increase my physical activity so that I am more tired and to get rid of my mid day nap but both are proving difficult to do as they seem to make me feel worse. Mornings are still worse than evenings. 30.4.2009 One of my aims for this year has been achieved today as I have just returned from a 6 day holiday. It was both good and not so good. We drove from Wellington to Taupo for two nights, Taupo to Rotorua for 2 nights and then on to Napier for 2 nights before returning home. It was lovely to get out of Wellington into the wide open country side and be away from home and the city. I did OK too for the first three days away. On the forth day we decide to go and visit one of the hot spring/volcanic areas. I had forgotten that this involved quite a walk - well a easy walk for most people but it was 2.5km - half of which was uphill. I was quite proud of myself in that I managed it OK, albeit a little slowly and I even felt OK afterwards and well enough to go out for a meal that evening but the next day I was so dizzy I was hardly standing and it took most of the rest of the time away to wear off. This holiday was kind of a test holiday to see what I can mange and what I can't, as I have a couple of things planned for later in the year. I know that I am going to have to be pretty gentle with myself on these other excursions. 1.6.2009 Since the holiday in April I have been embarking on an attempt to try and improve my fitness. It has been suggested to me that I need to do this following a graduated system - starting very slowly, increasing a little more each week or each couple of weeks. I have attempted this before but not got too far. This time I have been concentrating on my walking. I started walking just 6 lamp posts and then back home again and over 6 weeks managed to get up to about 1.2km. At that stage everything more of less turned to custard again and I found trying to continue with that was resulting in too much dizziness so I have given it away again and will attempt it again at a later date. 14.8.2009 The last couple of weeks haven't been so good. I have been working quite hard on a little paying job that I have been doing from home. I seem to manage to work a couple of hours a day without a problem but more than that is more difficult. Again the dizziness returned together with brain zaps so I have had to ease back on working a little as well. This whole recovery process seems to be a very delicate balance - certainly two steps forward and one step back and it is very easy to make yourself go backwards. - Tinnitus (buzzing or ringing in the ears) - have a feeling that this is hearing related and not benzo related - I am losing the hearing in one of my ears and that is probably genetic. Overall things seem to be improving but I still need to manage myself really carefully to cope. I have been to Sydney for a holiday and I have been on a 10 days cruise as well in the last two months so I am able to do those things now but they still take effort. "I would like to be well enough to fly to Sydney for a holiday, or if I can’t do that just to have a holiday anywhere because it has been 11 years since we left Wellington. I would like to be well enough to be able to walk up to my local shops when I want to. It is a trip of about 2km mostly up hill getting there. There is a nice little coffee shop at the top and it would be cool to go up have a coffee and then walk home. Just recently when I had a really good day, I did manage to get up to the shops but it wasn’t easy and I got a lift home – so I am looking for that walk to be fairly easy by the end of the year." So I did manage the overseas holiday. I can do the family shop and if I am having a good day I manage it well without spending the whole time wanting to keel over. I don't do it every week as yet but I do have someone keen to do it for me - I could certainly manage if I had to. Not doing as well on walking up to the shops. I can do that too but it nearly always results in my feeling awful for a couple of days afterwards. I am able to do a bit more in the area of fitness so I am hoping that this time next year I can walk further without it having an adverse effect. Over all I do have times, days on end sometimes when I feel good and can do heaps but then I crash and need to be quiet until I catch up with myself again.